Mack Brushes series 5880 is a Double Cutter with a Nickel Ferrules. buy here. These White Hog Bristle Cutter Brushes are excellent for outdoor work. Used by Sign Painters, Wall Dogs, and Billboard Artists all over the world. 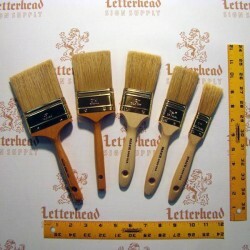 Sizes Available from 1" to 3", Length Out - 1-7/8" up to 3-1/8", Thickness Range from: 7/16" up to 11/16"
Cutter Brushes Double series 5880 size 1" by Mack Brush for Sign Painters is for rough surfaces like Stucco Signs and Brick wall Signs. Cutter Br..
Cutter Brushes Double Series-5880 size 1"
Cutter Brushes Double Series-5880 size 2"
Cutter Brushes Double series-5880 size 2" by Mack Brush for Sign Painters is for rough surfaces like Stucco Signs and Brick wall Signs. Cutter Br..
Cutter Brushes Double Series-5880 size 2-1/2"
Cutter Brushes Double series-5880 size 2-1/2" by Mack Brush for Sign Painters is for rough surfaces like Stucco Signs and Brick wall Signs. Cutte..
Cutter Brushes Double Series-5880 size 3"
Cutter Brushes Double series-5880 size 3" by Mack Brush for Sign Painters is for rough surfaces like Stucco Signs and Brick wall Signs. Cutter Br..